Feeling connected, doing good, a sense of purpose and fulfilment are all values many of us strive for in this day and age of rushed and busy lives. A group of vibrant Asian youth have come together to achieve just that. They have raised much needed funds for deserving charities which have connections with their heritage and ancestral history. Many of these youths are born and brought up in the UK. Their parents are mostly the generation that came to the UK from East Africa as refugees following the Idi Amin regime. Their grandparents have their roots in Western India, Gujarat. Connecting with their heritage gives the youth an added advantage of making sense of their unusual international background. In 2015, a group of London based cyclist decided to do their first bike challenge. An epic journey across the Sahara Desert covering over 600kms. What they experienced provided eye opening moments from being chased by wild dogs to staying in conditions with no hot water, sub-zero freezing conditions without any creature comforts we most use to. The adventure was so harsh it was as times doomed to fail and the words “give up” was on the tip of the tongue for most riders. However through sheer grit, determination and pride crossing the finishing line was crossed providing exhilaration and sense of accomplishment by all. Although none of the riders wanted to see a bike for the unforeseen future, a few weeks later it was decided we need to build on this and continue this momentum of doing good for ourselves in body, mind and spirit but also raise money for worthy Charities. The next bike ride was to take place in Gujarat India 2017; the ride was covering 350kms from Bhuj to Ahmedabad with 54 riders of all different abilities undertaking this challenge. The ride raised a phenomenal £160,000 for two Mumbai based charities doing fantastic work helping females rooted in poverty and prostitution trained up with life skills to become self-dependant. They have also provided education for their children to enable them to aspire to a brighter future. Following on from the Gujarat Charity Bike Ride in 2017, those who were unable to take part were keen that we organise another ride in India in 2018, when one of the organising riders was asked shall we do it? The reply back was are you MAD? The response was yes we are MAD, let’s Make A Difference Today. MAD was formed and a bike ride covering 400km from Junagadh to Bhuj was organised in April 2018. With 25 riders participating suuported their chosen charity doing amazing work in Junagadh. Inner Joy Foundation is helping blind children with education, care and shelter and also taking care of the elderly, who are most often neglected in society. The epic journey created lasting memories, with new friends created along the way. The bike ride raised a fantastic £60,000 for Inner Joy Foundation with the charity running on zero administration costs all monies went directly to help people who need it most. The challenges continue in 2018 with a second event organised by pedalling 4 change with a 500km bike ride planned for 24 August 2018. 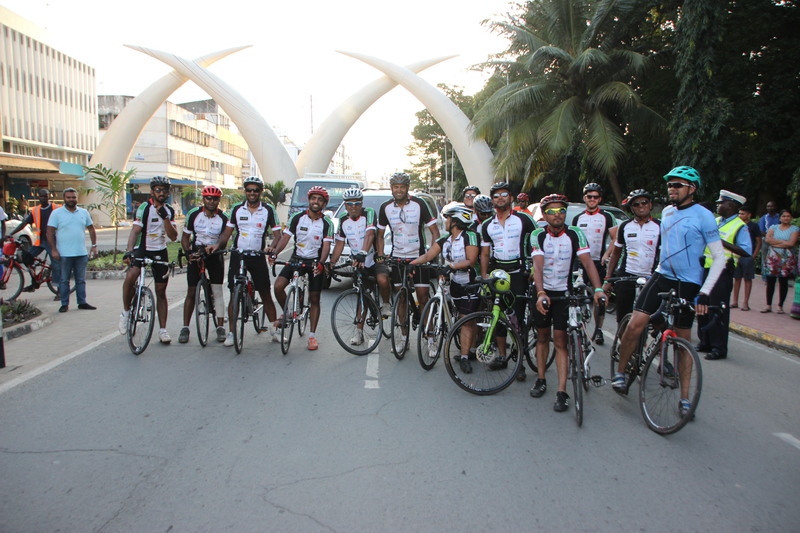 They rode from the hustle and bustle of Nairobi to the beautiful beaches of Mombasa over a three-day period. To top it off they raised £110,000 more for their chosen charity, Raha International which is a UK registered charity and funds underprivileged children’s education in Kenya.